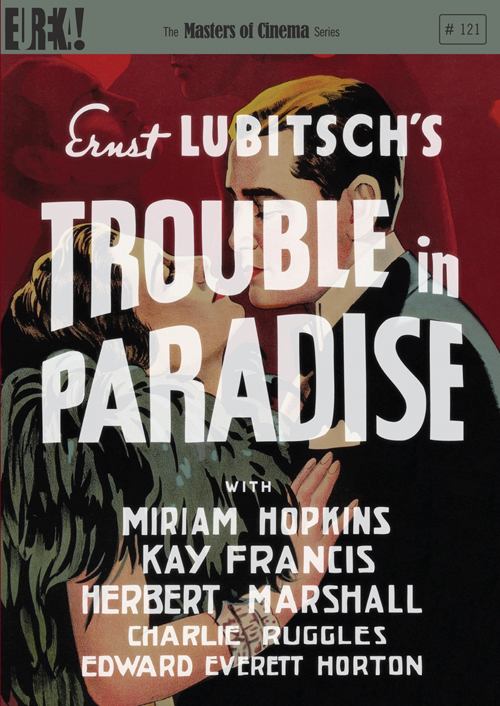 Ernst Lubitsch's period beauty can be, and has been, considered the blueprint for what is considered the modern day Romantic Comedy. Don't be fully fooled. Ostensibly a traditional caper, with more weighting placed on the relationships than the robbery, Trouble In Paradise is not quite to the 1930s what your typical Jennifer Aniston film was to the naughties. For a start, Lubitsch's film has charm and lots of it, a surface level gleam in the eye of the leads and a willingness to depart the plot into scenes of unbridled silliness - witness the cutaway segment of a whole host of employees and shop-holders saying 'oui madame' to rich queen of perfume Madame Colet (Kay Francis). There's also an actually good script (by Samson Raphaelson) to consider, one not built on flimsy one-liners, or reliant on the lead's flexible job position as a 'trend consultant' or some such. Perhaps though, Gaston Monescu's (Herbert Marshall) appointment as house secretary to Madam Colet is the 1930s equivalent. It is a job role which allows him to romance, socialise, steal and charm, all whilst being officially 'on the job'. The traits of the modern day Rom-Com are indeed perhaps, visible from a very early stage. So, like its modern day equivalent, it's little surprise to find that Trouble In Paradise is open to accusations of being slight. The initial Romance between Monescu and Lily (Miriam Hopkins) happens startlingly quickly, although the meeting is perfectly directed, and before you know it we're into a love triangle between Monescu, Lily and Madam Colet. There's little pause to develop the former two's life together, so when it seems like Monescu has Stockholm Syndrome, do we actually care? Are we supposed to root for his new union? Equally, there seems to be little at stake, excluding said slight relationship. Monescu has, we are told, been captured before but escaped, a key ex-contact of his doesn't seem to remember him when they meet. Why should we think he is in any more danger of imprisonment than any other major protagonist? But, like any good Rom-Com, Lubitsch knows that the essentially flimsy nature of his film's core does not matter a jot if by slight of hand he can hide it beneath tangible entertainment. Here, Trouble In Paradise excels. Loopy dualogues between Morescu and Colet start to sparkle as the second half kicks up a gear. The running battle between The Major (Charles Ruggles) and Filiba (Edward Everett Horton) provides constant comic relief. Morescu's attempts to undermine Adolph (C. Aubrey Smith) increase in humour. Jacques (Robert Greig) is a decent source of a silent chuckle. And meanwhile, while the director is entertaining you, he is also flaunting his not inconsiderable skill. Trouble In Paradise was Lubitsch's first Comedy with sound but the director is clearly not quite ready to fully abandon the storytelling techniques of silent cinema. Witness the conversation between Morescu and Filiba about exotic locations. No words are needed when the latter asks about harems and the former whispers in his ear, whilst the music changes slyly into a sultry Middle Eastern lull. Similarly, Lily, packing to go away with Morescu, starts slowly but as her fears increase that her lover will leave her the packing gets quicker, more frantic, her facial expressions harsher. The whole scene is accomplished sans dialogue but Lily's mood, which sets up the final scenes, is absolutely clear to all. Those final scenes see the audience provided with complete satisfaction by Lubitsch, who manages the characters well and provides a visual circle by returning to his lovely opening shot of a camera revolving around the exterior of a building. The technique is all there but, crucially, so is the charm. Really enjoyed reading this review. Nicely written. I also think Trend Consultant needs to be a real thing. Or the name of a band. Thanks, as ever, for the kind words Nick. I got that from Celeste & Jesse Forever, where, apparently (I haven't seen it) one of the leads is a 'Trend Forecaster'. Which is amazing.